Using new satellite imagery, telemetry, and machine learning techniques, Carbon Tracker is now able to estimate the utilization of coal-fired and other fossil-fuel power plants worldwide with a high degree of accuracy. That could give government leaders, policymakers, power and energy industry participants, and investors a big leg up in terms of improving their ability to evaluate coal and fossil-fuel power plants’ climate-change impacts and economic competitiveness. Power plant utilization data is critical to evaluating the amount of carbon and greenhouse gas emissions are being pumped into the atmosphere, as well as the amount of electricity they’re producing, and hence their economic viability. Yet such data is often untimely, unreliable or publicly unavailable outside the US or EU, Carbon Tracker points out. 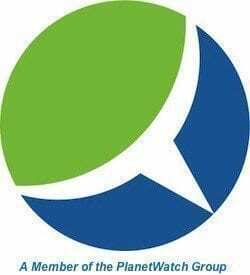 Carbon Tracker’s pioneering power plant capacity factor model has proved to be 91 percent and 92 percent accurate when applied to US and EU power plants. The organization then applied its methodology and model to coal-fired power plants in China. “We applied our satellite imagery methodology and integrated the plant utilization results at the local level to our ‘investment grade’ climate scenario analysis for coal power in China, of which provides insight into when coal plants should close and the potential stranded asset risk of delaying their retirement,” the report authors explain. “There is a revolution happening in space,” more specifically regarding our ability to gather a vast range of data pertaining to the Earth’s biosphere, according to Carbon Tracker. Nearly 1,800 satellites were in orbit and operational as of Aug. 2017; 596 of them are being used for earth observation. The revolution in space technology is taking place alongside a broader-based revolution in digital technology that’s transforming economies and societies worldwide, including the power sector, the think tank highlights. “This paradigm shift in the availability, coverage, and granularity of satellite imagery coupled with advances in machine learning are going to have profound implications for asset-level data and environmental monitoring,” the report authors state. 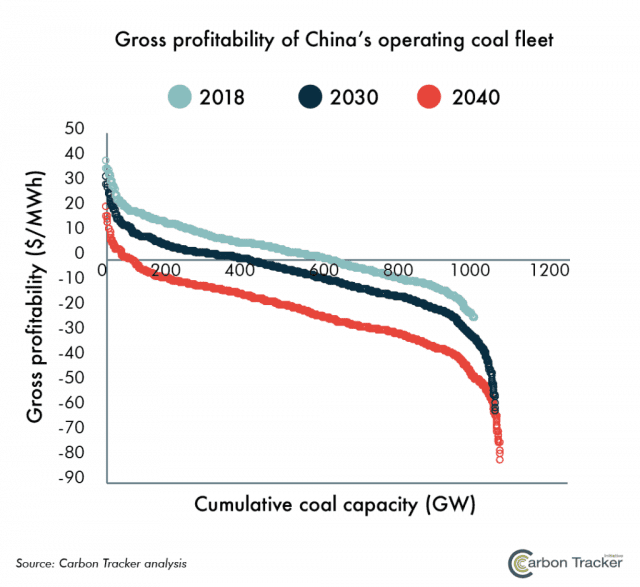 As the majority of units are loss-making from 2018 to 2040, Chinese coal power owners can avoid losing $390 billion by retiring the operating fleet in a manner consistent with the Paris Agreement. Cost-optimized retirement schedules show Guangdong Yudean Group, Zhejiang Energy Group, and National Energy Investment Group could benefit the most from premature closures consistent with Paris, with asset stranding as a percentage of the total capital of 117%, 101%, and 52%, respectively. China could represent one-third of global power generation and more than one-fifth of fossil fuel-based capacity by 2040, according to the International Energy Agency (IEA), Carbon Tracker notes. China is a signatory to the UN Paris Climate Agreement, which calls for rapid phase-out of coal-fired power plants by 2040 in order to have a good chance of capping accumulated carbon and greenhouse gas emissions below a climate-change tipping point of 2ºC (3.6ºF) this century. 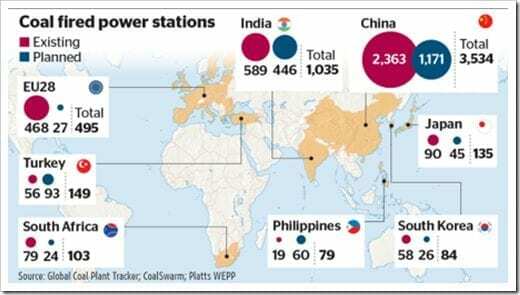 There were 1,600 new, coal-fired power plants being planned or under construction in 62 countries as of mid-2017, according to Urgewald, a Berlin-based environmental group which gets the data from the Global Coal Plant Tracker. Roughly four-fifths of the total, by capacity, are in China. Global coal-fired power plant capacity would surge 43 percent higher if they were all to be built and run, making it all but impossible to meet the Paris Climate Agreement’s goal. Carbon Tracker’s new methodology could give government leaders, power industry executives and investors a powerful tool to reverse course and go about phasing out of coal and fossil fuel power plants in the most economically efficient way possible. “Decision-makers need support to ensure an orderly and economically rational phase-out. Asset-level data and modeling lie at the heart of these retirement schedules. Our methodology can improve the data provision and accuracy of asset-level modeling,” according to Carbon Tracker.